As you know, I watch a lot of TV. A lot. But I’m very picky about what I allow my four-year-old to watch. My absolute favorite children’s show right now is Daniel Tiger’s Neighborhood on PBS Kids. And the best part? It’s my daughter’s favorite show too. Daniel Tiger’s Neighborhood stars the four-year-old Daniel Tiger who is the son of Daniel Striped Tiger from the beloved series Mister Roger’s Neighborhood. His best friends are O the Owl (the nephew of Uncle X), Katerina Kittycat (the daughter of Henrietta Pussycat), Prince Wednesday (the son of King Friday) and Miss Elaina (the daughter of Lady Elaine Fairchilde and Music Man Stan). That’s right – some of your adored characters from the Neighborhood of Make-Believe are back. Each episode of this fantastic program deftly tackles an issue important to preschoolers – from sharing, to coping with frustration, to jealousy, to toilet training- while creating a show that’s engaging for preschoolers to watch. Daniel is instantly relatable to children. He’s enthusiastic, clever and caring but not perfect. He makes mistakes and learns from them. 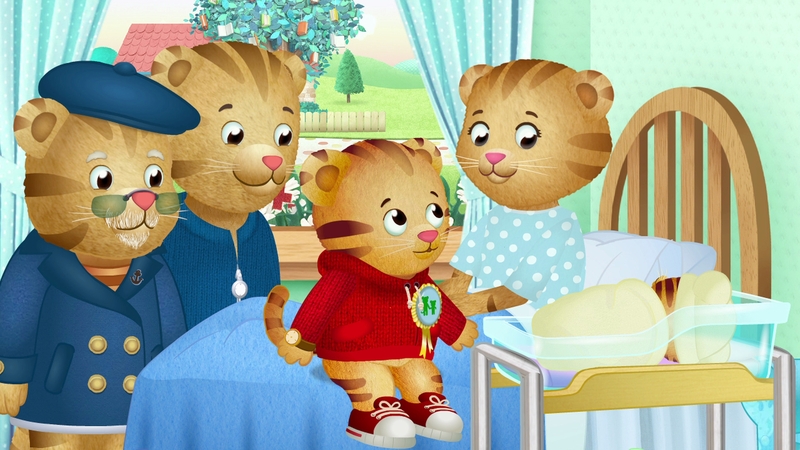 This week marked the second season premiere of Daniel Tiger’s Neighborhood and a big event for the Tiger family – the arrival of Daniel’s new baby sister! I loved the way the show handled the new addition to the Tiger family. I recently had a chance to do a short Q&A with Angela Santomero, the creator and executive producer of Daniel Tiger’s Neighborhood to talk about the series. Why did you decide to give Daniel Tiger a younger sibling? Why was the time right? Angela Santomero: We have been getting so many beautiful letters from parents asking for Daniel to share even more experiences and challenges that their own kids are going through. One major experience that many young preschoolers deal with is having a new brother or sister in their family so we decided to address that next! Adding a baby to the family is a momentous occasion, what were the important themes/messages you wanted to cover in these episodes and how did you decide on what to include? Santomero: We knew that we could really do this theme justice because of the way we lovingly write Daniel and the careful research we put into every episode. We felt it was important to devote a few different episodes to the arrival of a new baby so that we could fully address many of the key issues involved in this life change. We wanted to really show how essential it is to make time to sit down and to talk to your preschooler about the impending baby, to help them prepare – and let them have a helping role in the family. It was also important that the feelings of change around a new arrival were dealt with head on and we reinforced that a preschooler needs to feel loved and important. What do you hope preschoolers and their families take away from these episodes? Santomero: We hope that families see themselves in our characters and celebrate right along with us! It makes us so happy when we get letters from parents telling us that they now feel like they have the words to address the things they face every day with their kids based on our episodes. I love the musical refrains in each episode. Last night I finally got my daughter to try fish for the first time because she sang Daniel Tiger’s “Try a new food, it might taste good” to herself (and she liked the fish!). How are the songs/ musical refrains developed and why do they resonate so well with preschoolers? Santomero: The songs – or “strategies,” as we call them – are carefully written and researched by our wonderful team at Out of the Blue and we also closely collaborate with our amazing musicians at VooDoo Highway Music. The strategy jingles are carefully crafted to tackle complex socio-emotional concepts on a preschool level. These ditties are bite-sized lessons that are easily repeatable so that toddlers and their parents can use them in their everyday lives. We think parents and preschoolers will really enjoy singing along with the new strategies we’ll introduce in Season 2: “You can be a big helper in your family,” “There’s time for you and baby too,” and “Sharing with you is fun for me too” – just to name a few! What kind of feedback do you get from viewers of the show? Santomero: We are thrilled that we get so much positive feedback about Daniel Tiger’s Neighborhood. It’s wonderfully rewarding to meet families who love the show as much as we do. My favorite comment is when people say they can see the love we put into the show. I definitely wanted to make sure that the series was helping to promote the legacy of Fred Rogers, who taught us all so much. What else can we expect during season two on Daniel Tiger’s Neighborhood? Santomero: Lots of ridiculously cute baby moments, fun with Daniel and his friends, and awesome music that you won’t be able to get out of your head! We also have been working on an episode that celebrates Fred’s iconic words to help kids cope in times of need, “Look for the Helpers.” Stay tuned for that very special show on PBS KIDS, as well. Do you like Daniel Tiger’s Neighborhood as much as I do? Talk about it below. This entry was posted in Children's TV and tagged Daniel Tiger's Neighborhood by TV Gal. Bookmark the permalink. Amy — we love daniel here, too. And we are ALWAYS singing his little songs…”stop — and listen to stay safe” and “if you have to go potty, stop and go right away” are the ones most often heard in our house. We have little figures of the characters and they are often sent on adventures with Jake & the Pirates. My only dislike: I get so annoyed by the constant use of “toots” and “meow meow”. Drives me crazy!! I think the show is wonderful too. My almost five-year-old daughter is so excited about the new season, and we really loved the introduction to the new baby. I love the reminders of my beloved Mr. Rogers Neighborhood.